From September 13 to September 15, 2017, 395 people, representing over 230 organizations and government departments attended EconoUs2017 in Calgary. Since 2001, CCEDNet has partnered with members across the country to showcase the amazing work being done in different regions, to raise awareness of the impact of community economic development (CED), to examine new ideas, resources and strategies that will make CED practitioners more effective in their efforts, and to connect people who share similar values and vision. 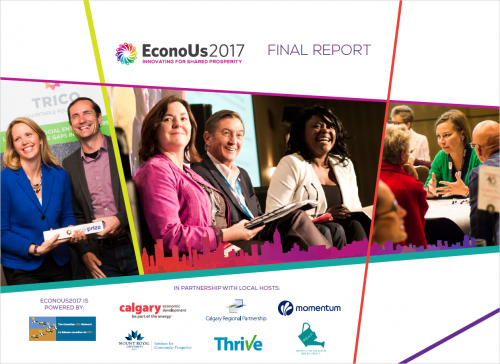 Thrive, a community leadership initiative of Momentum, brought together community partners including Calgary Economic Development, REAP Business Association, Institute for Community Prosperity at Mount Royal University and Calgary Regional Partnership to co-host EconoUs2017. Moncton, New Brunswick, will be the location of the next national conference, EconoUs2018, September 24-26, 2018. The New Brunswick Environmental Network will be co-hosting the next conference with the support of Co-operative Enterprise Council of New Brunswick, the Coopérative de développement regional-Acadie, the Centre for Local Prosperity, the Social Enterprise Network of Nova Scotia and the Community Sector Council of Nova Scotia. Watch CCEDNet newsletters for more information.